Club Penguin Cheats by Mimo777 Club Penguin Cheats by Mimo777: Club Penguin Stage Update! Fairy Fables will be returning to the Stage soon. Last year, this play won "Best Costume" at the Penguin Play Awards. So, be sure to check it out! Club Penguin says we will soon be able to vote on their blog to decide which plays will be competing in the Penguin Play Awards for 2010! Sweet, huh? So, which play do you think you will vote for? I think squidoid is the best cosstume for plays. I will be voting for Quest For The Golden Puffle because I LOVE Indiana Jones. if we had another award i would vote for Quest of the golden puffle again because it ROCKED MY SOCKS!!!! I don't know it is so hard to choose they are all so good! I would vote Ruby&The Ruby for best costumes, it was my first time seeing Ruby&The Ruby and i LOVED IT!!! I like Quest for the Golden puffle for the best! And Fairy Fables for Costume! And Ruby and the Ruby for like stage, cause of the hidden pin and stuff!! Yo CPG MODS need to ask ya something. What's Fairy Fables? What's with the sheep in the pic? Cp is the best game ever!! Is Cp the best game ever? To me Cp is definnently the best game ever! Please folow this important rule! Fairy Fables is a play thats like the classic tale of little red riding hood and also some parts of the tale Rapunzel. But with a twist! Rapunzel is grouchy, instead of the big bad wolf its the big bad Sheep! This is one of my favorite plays and I hope you'll enjoy it too. It's from the play Fairy Fables, the sheep i s amain star same as all the characters really! Lol! What's the penguin play awards? I don't know a lot of things since i've just started CP pretty much so help! And maybe something else but I can't remember! I'm sure you'll find out soon! Anyway those were the nomanies last time! Awesome! I remember my first comment! Actually I don't but I won't ruin the moment! I LOVE Indiana Jones too! GREAT MOVIE...wonderful. Because for me, I am a type of penguin who is FULL of adventures! Mannn..I know!! I love them ALL sooo much! Hmm...but if I could pick one..it would be...UGH I STILL DON'T KNOW! :( Club Penguin made really great plays! the penguin play awards was an award show that took place last year where we voted on the best club penguin play. Ok, Fairy Fables is a play that has been here from the past. It's REALLY GOOD. It's about this fair who tells tall tails about different things, like rupunzel is grumpunzel, little red riding hood is a different name too. It's AMAZING! I loved it! And I am sure you will love it too! What? Penguin Play Awards II? Member event again? I want to see at least ONE party without a member only room! Did you know when 'member only rooms' first started? On Music Jam 08, after Disney buys CP! YEAH! Get it? It's ok! We all understand! That's what Mods do, help other people! The Penguin Play Awards was an event that happened at the Plaza in the middle of 2009/beginning of 2009. We all got to vote on our favorite plays so far, Fairy Fables, Quest of the Golden Puffle, Ruby and the Ruby, and Gamma Girl and Shadow Guy. Wehn you entered teh stage, there would be PLENTY of chairs and a WIDE screen saying penguin play awards (in other words, it would look like an award show). Then there would be a backstage. There, you would be able to get a free item, a Penguin Trophy, and sometimes you could meet Cadence, Gary, and the Penguin Band there! This room was for members only. The Quest of the Golden Puffle won for most of the categories, and as you can see, when you look at its Trunk, it will show as Penguin Award's Favorite (something like that). Hope this helped! i don t think the quest for gold puflle,fairy fables etx. Welcome to CPG World! This is an awesome world that you can party, comment, becoming a CPG mod and have fun! I think the best play is Ruby and the Ruby! Because there was a pin for nonmembers =P JK. Hey, Mimo! Exams this week and gonna end next Monday. So I wont be Modding regularly. Thank you! Ruby & the Ruby for like everything, it is so cool, so many different things too! Fairy Fables is a stage play on Club Penguin. It is like a Fairy tale, but just not... well famous. It is a character is the play Fairy Fables. It is where you get to vote on the best plays throughout the past year. For example, you could vote Fairy Fables for best costume and Ruby and the Ruby for best stage music. Hey Mimo! I'm probably gonna vote for the Viking Opera if it's there! Otherwise, I would vote for Squidzoid vs Shadow Guy and Gamma Girl and have a Superhero parade around Club Penguin! lol! Yeah I agree! I love wondering around Club Penguin in my Squidzoid costume! Fairy Fables is a play with lots of fairytails mixed into it, but with a twist! For example, there is a prince delivering some crossants (like Little Red Riding Hood), there is a Big Bad sheep, (like the Big Bad Wolf) and a princess with long hair (like Rapuzel)! Also, there is a fairy telling the story from her house! It's a very weird and different play which is quite good! the club penguin play awards is where you can vote for your favorite play in different catagories. then, after the voting, they annouce the winners. my favorite play is the ruby and the ruby which i'll be voting for! the sheep is from the play "fairy fables," one of the plays you can vote for. nice example! but, it was kinda long. still, nice example! Snowball6778 said... What is the Penguin Play Awards? Last year in march we had an award ceremonie for the best play! On Club Penguin in March 2009 we got to vote for our favorate play! Fairy Fables won! Also at the PPA you can meet cadence,gary,Aunt Arctic & the Penguin Band! That sheep is a character in the Play Fairy Fables! He is called 'Big Bad Wool!' If your a member you can buy his outfit! Ruby & The Ruby is the best! You will never guess what we got in the mail today?! A Club Penguin Postcard! Me and my brother sent Club Penguin a Christmas card and they sent us a Postcard in return! It's so cool! If you want to see it we can scan it and send it to you. Hi Snowball6778. The Penguin Play Awards are hosted at the stage. It's where you can vote for the best music out of all the plays, best costumes, best play, and things like that. If you are a member there is even a room you can go in. Sadly, it's a member only thing. There's a really cool video that they show with all the plays in the Penguin Play Awards. The nominees are usually plays that have been popular or ones that have been shown a lot. Hope I helped! Sorry this is totally off topic but, My computer says I have visited this site 75 TIMES in the last MONTH!Wow that is a lot! A mod stands for moderator, someone that answers questions, makes sure the site is safe and all that stuff. Cool, it is the first comment on the post too. Hope you enjoy Mimo's site! I would vote the robot penguin one lol. Probaly The 12th Fish, The Penguins That Time Forgot, Haunting of the Viking Oprea, Red V.S. Blue, and Space Adventure. I think Norman Swarm, Quest for the Golden Puffle, Fairy Fables, Some Other New Play and I think the Twelfth Fish will return. It's a costume in the awesome play "Fairy Fables"
The Penguin Play Awards is catagories. You vote what place has the best of the catagory. I love the Penguin Play Awards! I love that costume,you can use it anywhere, oh back to what I'm modding on, ok jamchip if your making just a regular comment don't put CPG Mod or you won't be one, remeber in the Moding rules,don't put CPG mod if your not answering a question. That's the Big Bad Sheep, replacing the Big Bad Wolf in the story! Can you believe this!! CP only released 3 NEW plays in the whole 2009 year!! Geez! It rocked my socks to, there still dancing in my closet! I know there all so good, but don't worrie I know you will figure out what play you like best! THE MIMO HALL OF FAME! He would put Famous/Great CPG mods on there... best parties on there... best plays on CP... etc. Just an idea. Oh, and my vote is the super hero one. i forget its name. I loved it to! The pin and the costumes, it was awsome. Fairy fables is a play which has 3 or more plays in it. Fair fable has the big bad sheep, who is just hungery to tell you the truth. It just and awards thing for plays like we get to vote on what plays we like best! Mimo Level 26 on Fragger! Soccerbro22, You're correct on everything except the plays you can vote on, forgot about viking oprah?, The underwater play? Fairy Fables is a play that comes to the Stage. Hope i helped. Part of Fairy Fables. Hope I helped. It will also take place this year and probably many upcoming years. Well done for being a Mega Mimo Mod! Yeh even though I'm a member it is awful for those non-members, I feel for you! Seriously! Cool, my fav play would have to be Ruby and the Ruby, lol total opposites. oh yea! that was really fun! i think it was the best set too. i loved also! I have never thought of that! Pretty original idea too!The name of the super hero play is Squidzoid VS Shadow Guy and Gamma Girl. Hey that,s good! If you post more and more and answer questions you might be able to become part of the MODs. Tons of people try out a lot. but mimo piks the best! Fairy Fables is a play where there are sheep, a fairy , and repunsel. It is a cool play with cool costumes! Metalp10- CPG MOd in training. Wheres this backstage everyones talking about? ~~~~~~~~~~~~~~~~~~~~~~~~~~~~~~~~~~~ It is where you vot for your fav play in catogories like, costume acting set story and others. i started cp almost a year ago and i think i started right after the penguin play awards so here is what i think and heard what it is: its an award seromony where you vote what the best play is on cp, the best costumes, the best set, the best script, all that stuff. alot of famous penguins are there also i think. Welcome to the commenting of the Club Penguin Gang's many readers! If you have any questions about CP, post them here and the MODS will answer them! Yo Snowball6778! Here's the answer to your question! Fairy Fables is a CP play and it is pretty much a fairy tale play. It has some pretty awesome costumes and many penguins find it too girly. You can buy a sheep costume from this play's costume trunk, and trust me, the sheep costume is AWESOME! I recommend that you buy it because you can put it on with a funny hat or pair of glasses and you look really cool! Actually Quest for A Golden Puffle won last year! Fairy Fables is a wonderful play that involves a fairy telling a story that follows the plot of Little Red Riding Hood. Polkadotblu9 is doing a great job at modding! Keep it up! Don't worry! The awesome CPG MODS will help you with anything you need! The Penguin Play Awards are when penguins can vote on the best plays based on different categories. Then, there is a party at the stage and a lot of famous penguins are backstage! Yes! You are 110% right! As I mentioned in a different post, I recently e-mailed CP asking them to do stuff for nons and they replied saying instead of advertising, they have memberships and they use the member money to fund the parties and etc. P.S. Congratulations on being a Mega Mimo Mod! I am still trying to be a mod... I have been trying since October '09! Still, I think CP is trying to set it up like a real award show and in a real award show, it would be boring if (ex.) The Black Eyed Peas could only win ONE award.... and plus 2 awards is better for bragging rights! It's great that you are helping somebody new, but one of the MOD guidelines is that we keep our responses short... good description though! Fairy Fables is a play at the clubpenguin stage that is about a penguin named Twee reading out of a storybook. But not just any story book, but a certain story book that is like all off your favorite fairytales put together with an added funny twist and Twee's comments on each story and what she thinks should be in the story are in the script, also. It's an old play on clubpenguin. Located in the stage. Hmm... How to explain? Well the penguin play awards is a time when all the penguins got to vote on their favorite plays! Their were 5 catagories, the Quest fo the Golden Puffle won most of them, so if you hear of a play winning one, i hope that now you know! It's where penguins vote for things such as plays. Fluff528 -I COMPLETELY agree! (This message is mostly directed towards kkkkkk123) You DO NOT say cpgmod UNLESS you answering a question. Oh and Mimo, i forgot to put cpgmod on the end of my other answers! Srry! Fairy Fables is a play about a fairy named Twee, who is telling fairytales, completely out of the ordinary. She even made Repunzel into "Grumpenzel"! It's girly, but kool! I like the Ruby and the Red or whatever it is. That's one of the characters in Fairy Fables, the "Big Bad Wool"! Phunnie huh? Fairy fables is one of the plays held at the stage, in the plaza. The plays change every once in a while, but mainly they just rotate around the same plays. Fairy Fables is a remake of a fairy tale. The Penguin Play Awards is/was an award show held at the stage in April '09. It's coming soon, though! You yourself get to vote in different catagories for the best play, like Best Costumes, Best Set, so on. Hope I helped! NO! Clubpenguin NEEDS member rooms because they need money to make clubpenguin better for everyone! And to convince people to become members and so that they can make money, they SOMETHING to convince them (us), to become members. so, in the end, its better for ALL of us! And i am srry if you disagre, but it is true. Well, the penguin play awards is pretty new, and happens once a year. The users of club penguin get to vote in different categories such as best costume and such things. There is a member's section in the back, but the front is for all. The penguin play awards are held at the stage. I agree! Disney has made tons of new member events for every occasion. I love Disney, and they do need to make $$, but really...! It is a play at the stage about Fairies. Lol, True though! You are right! Also here's a really good example too. In the last mod change I wasn't on the list as a new mod, but then I heard from Saavy that if you put (CPG Mod) after your name when you're not answering a question then it will actully lower your chances and I listened to that advice and now I am one! It's a Character in Fairy Fables. This will be the first time I see Fair Fable. Hey Mimo how ya doing! I know this is off topic. Cool! Glad to see you then! Dont worry, Mimo probably counted it though! I just noticed that! Woah! Club Penguin needs to get busy! Mimo, can we meet sometime for you to add me on Club Penguin since i am a Mimo Mod? If i comment a time that i can meet so you can add me, will you come? If you can't i understand. It is a thing were you vote for your favorite plays. Like the golden globe awards. It was a play about fairys at the stage. Club Penguin can't release a lot of new plays in the year. Plays take a lot of hard work and they have to do other things. We were lucky we got 3 new plays this year. As i said, Club Penguin is very busy they have to update several other things so don't push them to make new plays. There is a sheep invilved in Fairy Fables. On CP they have a contest for the best Club Penguin Play and that is the penguin play awards. The sheep is one of the characters in Fairy Fables, one of the plays at the stage. It's costume is available for purchase by members via the costume trunk. Awesome! I think that won in the Penguin Play Awards last year. Cool. I'll vote for Ruby and the Ruby. Love the mystery secrets and the Noir costumes. Club Penguin can't release a lot of new plays in the year. Plays take a lot of hard work and they have to do other things. We were lucky we got 3 new plays (this year). As i said, Club Penguin is very busy they have to update several other things so don't push them to make new plays. This question is way of topic but what is pangaea? Pangaea is when the continents were joined together as one single landmass but later they slowly drifted apart as the theory of continental drift. Syy, a lot of penguins are spending money on CP memberships. So it'd be a good idea if CP would just hire more people to minimize the load of work. P.S. i will vote for the 12th Fish! I liked the first EVER play, alien adventure. Awesum set and costumes. Fairy fables is basically a fairy tale with a twist, instead of the big bad wolf, we have the big bad wool, (a sheep)and instead of rapunzel theres grumpunzel. All the characters have their classic names changed. I know what you mean!! im a member and if i can see that its unfair for Non-members, why cant disney?! Mimo! I didn't put CPG Mod at the end of my last post, but it was an answer! The backstage is a member's only area and part of the penguin play awards. It is only accessible at the penguin play awards and is behind the main area of the stage. The superhero one was called Shadow Guy and Gamma Girl Vs. Squidzoid, or something similar to that. The play, (I think), was so popular that they released a sequel, with another monster. The costume has a special animation that makes you hold like a plasma ball. I didn't really enjoy the awards, sadly. As I view it, it was a big thank you to members,(which I am not), and totally outcast the non-members. The voting was good, but I wish non-members could get some item out of it. UNDERWATER ADVENTURE THE BEST PLAY EVA!!!! I will answer both questions. Fairy Fables was a kinda cool play with great costumes. It was about faires. The sheep was one of the cool costumes. It's a party where you vote for your favorite plays and the plays win awards! I agree! MIMO! Make a Hall of Fame pleassssse! It is kind of a Indiana Jones Play. A Play at the stage. i missed the penguin play awards last year but i will vote for quest for the golden puffle because the costumes are great and its based on indiana jones and almost everyone likes indiana jones. Also does anyone remeber what the first play was? I cant remember! 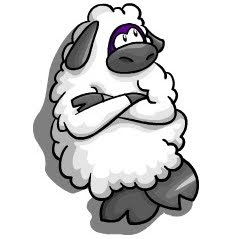 Hey mimo whats with the thinking sheep in the pic? Anonymous said i missed the penguin play awards last year but i will vote for quest for the golden puffle because the costumes are great and its based on indiana jones and almost everyone likes indiana jones. Also does anyone remeber what the first play was? I cant remember! I can!!! It was called "space adventure" It was kool but could have been better!! Just 'no'(?) Can you explain this please? And here's an advice. If you try to go up on Mod List, this will be better if you dont answer people's comments with short answers.. Try to comments as long as you can! Thank you! I hope you go up on mod list quickly! i think norman swam had some pretty good outfits..but golden puffle is the BEST! I am gonna change my ideas about CP! Thanks! Yeah, CP doesnt use advertisement (except on Disney) and have to make money, huh? But my latest idea is, they dont have to make at least one member room in ALL parties.. Just an idea. Keep modding and good luck!! Pangaea is what the continents all joined together was called. That was a very long time ago, though. The plates underneath the earth's surface moved, causing the continents to move. That is how all the continents were formed. Can I please be a mod? I have been on this site for almost three years and still have no idea how to become one. If you ever get down to this potentially last message, can you please consider making me a mod? In the penguin play awards last year they had a backstage for members where you met Aunt Arctic, Candence, The Penguin Band or Gary! I met Gary in there! I only have to find the Penguin Band, Sensei and Aunt Arctic! That if one of the characters in the Stage play, "Fairy Fables", the Big Bad Wool. Lol, get it? Wool? Wolf? Haha...? To Anonymous, great idea! To Racet, yeah I agree! To Mimo: PLEASE?!?!?! Lol im Fluff458 but thanks for understanding!!! Wwell, you see, Mimo can't just automatically MAKE you one. Here is how it works: Just answer a comment someone leaves, like I am. You have to do this often, so the Club Penguin Gang "workers" will realize what a great Mod you can be. (Not trying to brag) I Modded so much, I was the first to enter the "Mod Team" as a Super Mod! Mimo only updates the list every so-often, you probably have to wait another month or so. Sorry if this is a long comment! I hope to see you on the Mof list soon! Kool! Last year, at the PPA (Penguin Play Awards :D) I met Cadence and PB! I only have to meet AA (Aunt Arctic) now! I missed her during the holidays! Well, Fairy Fables is a play about a prince delivering croissants to a grumpy princess. the princess doesnt like croissants, so the Big Bad Wool [sheep] and the prince gobble them up. The picture is the big bad wool. Hnwjanuary11 is right, you have to work hard to get on the list, even I'm not a mod yet! I bet if I try a little harder, then eventually Mimo will put me on the list. And Hnwjanuary, you put see you on the (mof)<-mod list! I don't really remember my favourite play, though I'm sure Ruby and the Ruby was good. Personally, Norman Swarm was pretty average, and actually quite boring to me. I think it will win best for costume though. i am not a mod but i will answer your question anyway. Fairy fables is a very popular play on club penguin. To take part in the play check out the club penguin times to see whaen it arrives at the stage! The Backstage is a member only room featured at the Penguin Play Awards. There's usually a free item and cool decorations. You can also meet rare penguins there.